Microsoft has promised that the new menu and user interface that launches with the Xbox One X will not be bloated, and is being designed with performance as a priority. The original Xbox One UI was criticised for being confusing and unintuitive, originally using the Windows tiles design and Kinect motion controls. 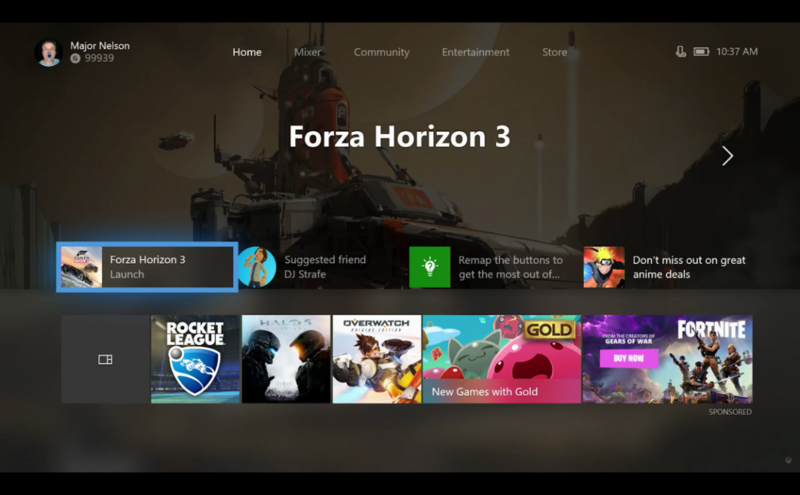 Microsoft has since tied itself in knots redesigning the dashboard in the years since the Xbox One launched, updating it within months of previous changes and adding more features on top of those already included. Now Mike Ybarra, vice president of Xbox and Windows, has told VG247 that the new dash will be streamlined as it has to work across all Xbox One systems, regardless of the power or feature differences between the Xbox One X, the Xbox One S and the original console. “We’ve thought about this. We said… wow, when we come out with X we’ll have so much more power, so much more RAM. What do we want to do? What I told the team is, we don’t want to do anything. Because of exactly the point you’re making,” said Ybarra when asked if the dashboard could suffer from feature bloat. “I think everybody recognizes that when we launched Xbox One X… Phil [Spencer] and I have talked about this, we had a lot of just general improvement to do in terms of the UI and the responsiveness of the UI. “I feel great about where we’ve come today, but we designed this UI to be across the whole family and to only use a static amount of system resources so that even on S and the original Xbox One it runs absolutely great,” said Ybarra. Although Ybarra spoke of streamlining the interface, he said it’s still early days before Microsoft settles on a final design, and it’s being built with user feedback before the Xbox One X launches in November. “This is still early,” he said of the new menus. “We have a host of feedback, and this is still super early. “We’re getting… there’s a lot of, like, even pins, I put on Twitter and other areas that we’re going from 18 to 40 pins… there’s small adjustments like that we’re making.